Godfrey L. Simmons, Jr. is helping put a man on the moon nightly over at Theatre Row, where is he currently starring as “Major Taggert” in The Winning Side a new play by James Wallert, presented by Epic Theatre Ensemble. He is also a Senior Lecturer teaching Acting at Cornell’s Department of Performing and Media Arts and is the Artistic Director of Civic Ensemble, an Ithaca-based theatre company that produces new and overlooked plays by or about women and people of color, re-imagined classics, and community-based plays. With Epic Theatre Ensemble, he has appeared in the world premiere of A More Perfect Union, Widowers’ Houses (which he co-adapted with Ron Russell), Einstein’s Gift, and Measure for Measure. 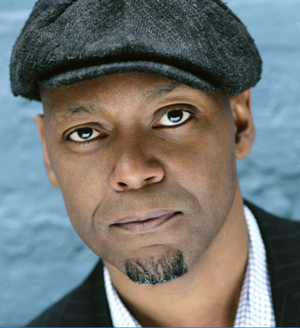 Godfrey has performed Off-Broadway at theatres such as Primary Stages, Playwrights Horizons, Ensemble Studio Theatre, The Working Theatre, and Melting Pot Theatre. Catch him in The Winning Side through 10/28 and now a moment with him “On The Couch”. Participating in my son Samuel’s home birth. Icewine! So good. So sweet. On Tyranny by Timothy Snyder. Doing a horrible job keeping up with dear friends and family. I’m at a regional theater playing Walter Lee Younger in Raisin in the Sun and during a performance we’re doing the scene where Bobo comes to tell me that Willie Harris took the money from our liquor store deal. And he never shows up. We’re vamping onstage when the phone rings. I pick it up and of course I make the caller Bobo—only I’m experiencing a severe case of denial because I KNOW Bobo is coming and phone was just buying time. So I “tell” Bobo to hurry up and HANG UP THE PHONE. Because Bobo is coming. Oy. Well you know what happens—the phone keeps ringing and I keep answering—because HE’S COMING—and the actress playing Mama whispers from backstage “He’s not coming! He’s not in the building!” And so I finally mercifully do the scene on the phone. Oof!